If You Think You Can Do It, You Undoubtedly Can! Danaëlle: Today was definitely an enriching day. We started at Suffolk University for a fruitful session based on the meaning and the importance of circle practice, and how helpful tools in including everybody and focusing on who is sharing. We also returned to Fisher College to learn about adaptive sports with three representatives from Adaptive Sports New England. My favorite part of the day was when we were trying to play blind soccer and a partner had to direct us while we were blindfolded. I felt like I was experiencing what blind soccer players might face every single day of their lives, however, I realize that I’d never be able to fully experience what their daily and soccer routines really look like. I also enjoyed learning about about new sports through videos of the Paralympic Games but the most important thing that I learned today is that in sports, it doesn't matter whether or not you have a disability. Sports create limits. They exist only within yourself and you can change this mindset if you wish. If you think you can do it, you undoubtedly can! Ana: Today we had the opportunity to learn about the Paralympic Games, an important international, multi-sport event that involves athletes with disabilities. These high-level athletes strive for their dreams, despite their physical disabilities. This is something that fills me with a lot of inspiration to also achieve my goals. I also want to fight like them and achieve what I set out to do. We also have a duty to include these people in our communities by creating new sports techniques where they can participate and so everyone is involved. We also had the opportunity to try some adaptive sports like sit down volleyball and blind soccer. The Sports Visitor Program entitled, "Youth Soccer and ESL", brings 20 participants from Costa Rica, Haiti, Panama, and Venezuela to the U.S. for a fast-paced short-term sports cultural exchange. Hello! My name is Sirasak (aka "Oak") and I am from Thailand. My favorite part of camp so far has been seeing my teammates smile and having fun. Being part of a team makes us happy and helps us find new friends. Many thanks to all of University of Illinois coaching staff who helped teach wheelchair basketball techniques. I would also like to thank everyone who made it possible for us to come to the U.S. and learn about different adaptive sports, practice wheelchair basketball skills, and get to know new friends from all over the world. Thanks for the opportunity! Hello! My name is Adisak (aka "Add") and I am from Thailand. I'm very happy and it has been a pleasure to get a chance come to the University of Illinois for this camp for training. Although there is a language barrier between me and my friends on the team, we are still able to communicate with each other. This camp helped me be brave and more comfortable in speaking English more, especially when we are all training together. I'm very happy with our time at the camp! Hi, my name is Soraya. I come from Thailand. On this Sports Visitor Program, I saw that almost everything here on campus accessible for people with disabilities. Here, people don’t think people with disabilities are different. People aren't separated by ability and instead we all work together. I like this poster in front of the gym that says: "This is a place for everyone". I am impressed with the gym at the university. It is very big! When you're training, you can see the view outside and there are many hoops and courts for practice. My dream is to build something like this back home. We need to have a space like this in Thailand for team trainings or for similar camps designed for youth with disabilities. This program has given me so many positive experiences and I am very thankful for the opportunity! Hello. 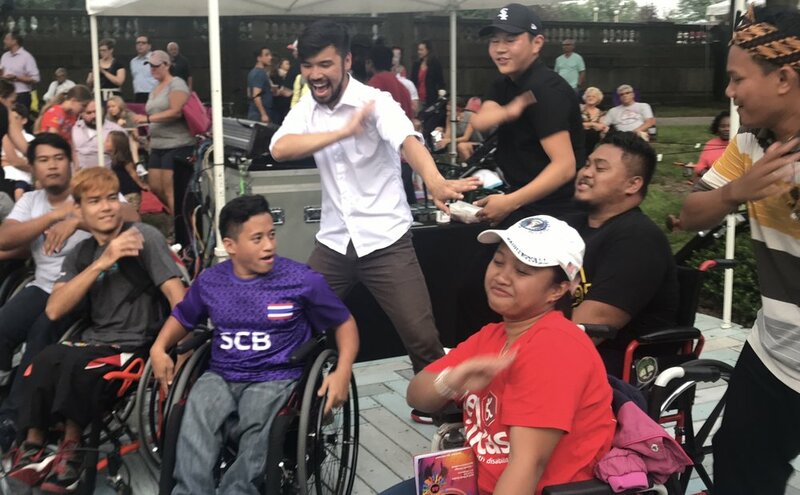 My name is Teerapong (aka 'Bas') and I am a member of the U-23 Wheelchair Basketball Team in Thailand. 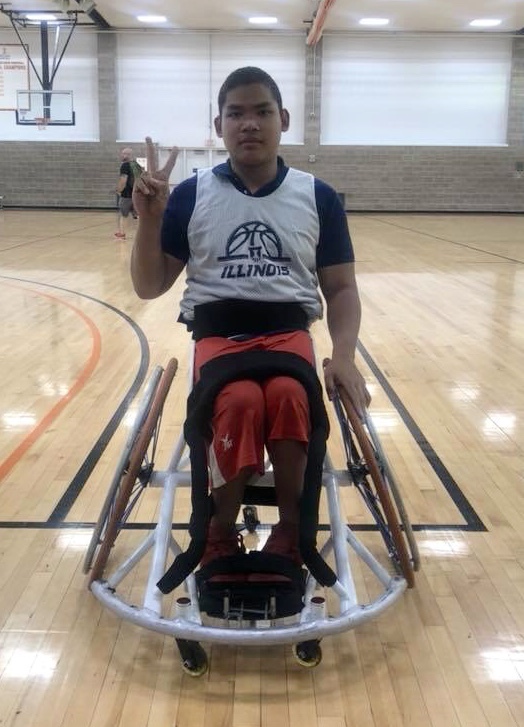 I am very happy to be here at the University of Illinois at Urbana-Champaign this week and participating in the wheelchair basketball training camp. During the camp, I intend on practicing hard and taking note of all the knowledge we are taught in each session. When I back to Thailand, I will use that knowledge and training to continue to develop my skills in this game. 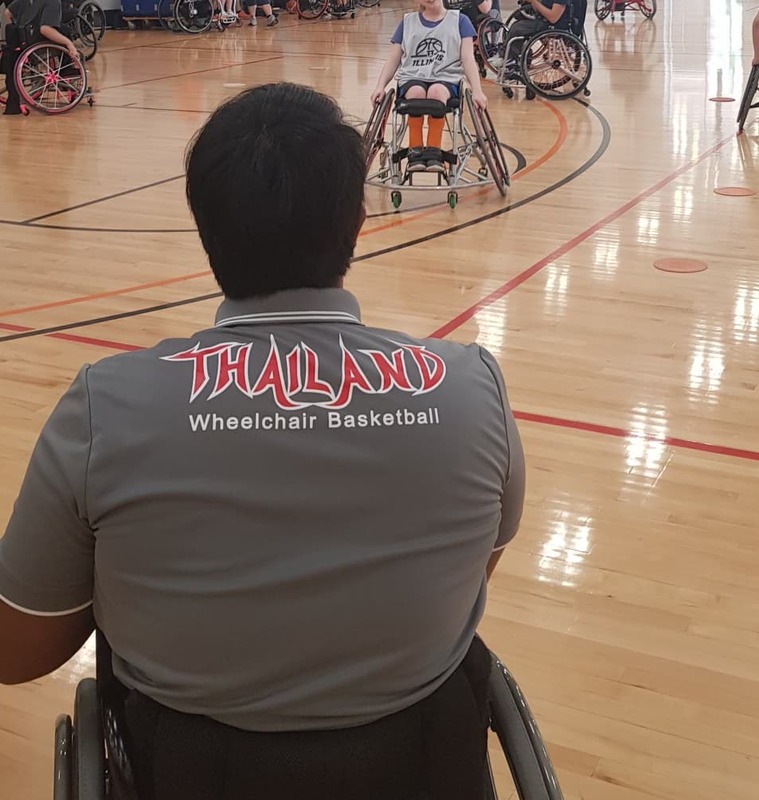 Also, I want to share my experience and teach the next generation of wheelchair basketball players in Thailand. Hello, I am Samat but people simply call me Sam. Unfortunately, our first week in Chicago is over and I feel sad about it. We had so many unforgettable experiences and I am pretty sure that all of my friends here on the program will agree with me. We are extremely lucky to be here as representatives of our countries. Our friendly group visited magnificent places like the Willis Tower, Adler Planetarium, Chicago White Sox Baseball Stadium, Shirley Ryan's Innovative Rehabilitation Center, the Mayor's Office for People with Disabilities, and of course the United Center where history was made. Personally I am so lucky because yesterday was birthday and it was awesome. I am truly blessed. Today we arrived at the University of Illinois at Urbana-Champaign where our second-week journey will begin. It was the first day of the wheelchair basketball camps and the youth athletes had so much fun playing the game together. There was a great sense of teamwork too. It was just a first day but I am so excited about the days to come, specifically in learning more about wheelchair basketball and how to be a good coach. Cheers! Hello, everybody! My name is Dastan and I am from Kyrgyzstan. Today we had a wonderful day. We sailed in Lake Michigan with the Judd Goldman Adaptive Sailing Program. After a long morning of sailing, we had munch and then had a sports psychology workshop with Adler University. We learned the importance of strengthening your mental game as well as your athletic performance. Later in the evening, we went to the United Center to watch the Big 3 basketball tournament. Back home in my country, I usually do not try everything but in Chicago I'm trying many things for the first time and I really like it.